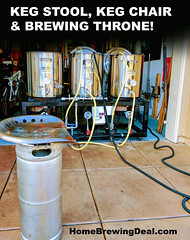 Coupon Item Description: Adventures in Homebrewing has their Cyber Monday Homebrewing Sale Going on now! They sale includes big savings on home brewing kegs, homebrew starter kits and much much more! This is a great opportunity to save some cash on homebrewing gear and supplies! Coupon Description: MoreBeer.com promo code for a 32 oz container of Star San Home Brewing Sanitizer. This More Beer coupon code is for Star San homebrew sanitization solution. Star San is a high foaming home brewing sanitizer. Star San’s foaming action insures coverage and contact time in larger vessels and better penetration into nooks and hard to reach places. Any foam that is left over in your carboy or keg will not harm your beer or you, and is perfectly safe and non-toxic, nor will it impart any flavors or odors. If you plan on making some up for spray application it is best to use distilled or RO water to maximize the life of the unused portion (minerals in tap water reduce the shelf life of Star San once in solution). If a lower foaming alternative is preferred, for bottling or multiple batches, check out Saniclean. Northern Brewer currently has a promo code where you can save $100 on a MegaPot homebrewing kettle when you make a purchase of $200 or more. Homebrew Black Friday Sale – 25% Off Everything! Homebrew Supply Black Friday Sale – 25% Off Everything! Coupon Description: HomebrewSupply.com has a Black Friday sale going on where you can save 25% off of your entire homebrewing or home wine making order! If you were planning on stocking up on home brewing supplies or homebrew ingredients, now is the time to do it and to save big! 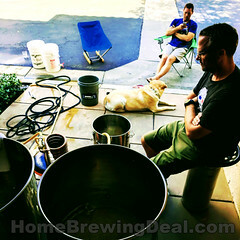 Coupon Item Description: Adventures in Homebrewing has their Black Friday Sale Going on NOW! 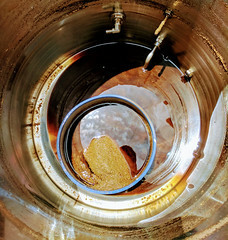 It is that time of the year again where the home brewing savings get bigger and better. The competition is fierce out there and many of the major homebrewing stores are posting big sales. Right now Adventures in Homebrewing has an incredible sale going on where you can save a bundle with their 2015 Black Friday Sale that is good from now until Saturday at 3:AM. Coupon Description: MoreBeer.com promo code for a Homebrewing Stainless Steel Thermometer. This More Beer coupon code is for a Homebrewing Stainless Steel Thermometer. This home brewing thermometer has a superior design that provides a faster response to temperature changes and assures more accurate readings than cheaper versions. What does this mean? You don’t have to tap the gauge with your finger for an accurate reading. Get Free Shipping at Adventures in Home Brewing! Coupon Item Description: Adventures in Homebrewing has a great home brewing deal going on. Right now you can a stainless steel 8 gallon homebrew kettle for just $49.99. This is the best price for a 8 gallon beer brewing kettle that I have seen and is great for 5 gallon homebrew batches. Coupon Description: MoreBeer.com promo code for a 50′ Copper Immersion Wort Chiller. This More Beer coupon code is for a Homebrew 50′ Copper Immersion Wort Chiller. 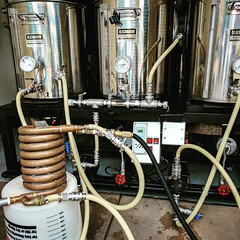 This immersion chiller is made of 50 feet of ½ inch copper tubing, which is some of the highest quality tubing that you can use in your brewing process. It features brass fittings for garden hoses on either end, giving you easy access to your water supply, as well as a bend at the top to fit over the lip of the kettle. If you’re looking for a truly premium chiller to use with a 10 gallon batch in a converted keg or a kettle, this is the one for you. Coupon Description: MoreBeer.com promo code for a Digital pH Test Meter.